It broke our hearts to lose you You did not go alone, For part of us went with you The day God called you home. You left us peaceful memories Your love is still our guide, And though we cannot see you You are always by our side. Our family chain is broken, And nothing seems the same, But as God calls us one by one The chain will link again. It was found hand written on the back of a card, in my Granny's handwriting. It is a lovely poem, and one that seemed exactly right for her service. 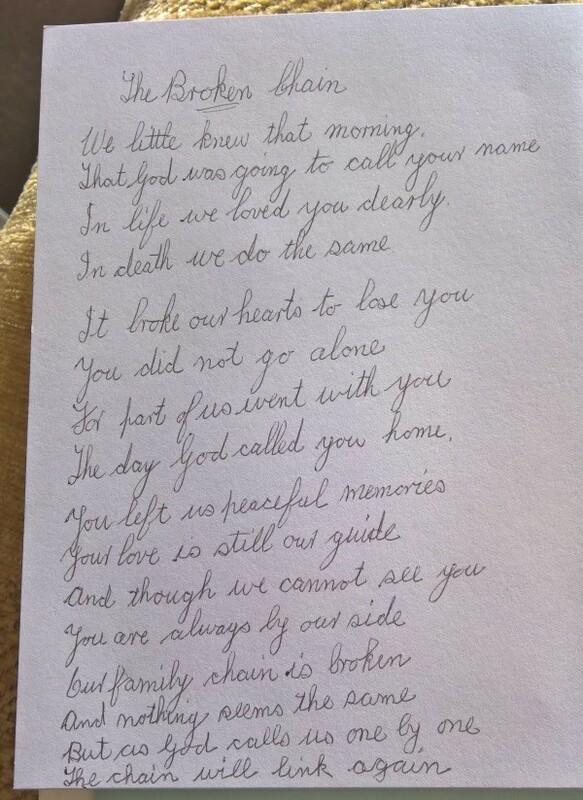 We are not sure exactly why my Granny had chosen to copy down the poem onto the card, but there must have been a reason. A bit of research turned up the following website, which credits the poem (in a revised form) to Ron Trammer. Thank you for your lovely words.